I am a self confessed dive addict! So, when it comes to planning a dive trip, I believe that there is simply nothing better than a liveaboard. Whilst many “normal” people like to laze around a pool, read a book and simply do nothing more than eat, sleep and relax on holiday, for us dive addicts, our perfect way of switching off from the stresses of modern life is to dedicate our time to the liveaboard rhythm. The perfect liveaboard rhythm for me goes something like this: eat breakfast number one, dive, eat breakfast number 2, dive, eat lunch, dive, eat afternoon tea, dive, eat dinner, night dive, eat dessert and have a glass or two of red, sleep, repeat. Or the shorthand version: dive, eat, dive, eat, dive, eat, dive, eat, sleep, repeat! Intersperse a massage or two and sharing stories with like minded people and you’re well on your way to a perfect dive holiday. Now I appreciate that not everyone is as obsessed with diving as me. If that is the case, a dive resort in a beautiful tropical location with 1 or 2 dives a day may be perfect for you. Personally, I find resort diving more of an effort for both shore and boat diving than having the dive site on your doorstep on a liveaboard. I prefer to spend my hard earned cash and annual leave diving and liveaboards are often better value when you add up the total cost of accommodation, food and diving compared to resort diving. There is a vast array of choices when it comes to liveaboard dive trips which can be a little daunting to navigate through in order to make your selection. But armed with the following tips, you should be able to competently navigate a smooth course and ensure that you select the best trip for you. Increasingly divers have a “bucket list” of places they want to dive and there is certainly no lack of information on where the best places in the world to dive are. I would suggest that whilst useful, publications detailing what the “Top 10 dive destinations” are or the “Places to dive before you die” should be taken with a pinch of salt. Dive destination selection is a very personal choice and unless the author has dived every possible dive site in the world, in every location, in every possible combination of conditions I would advise caution! But they may provide plenty of food for thought and inspiration, so maybe a good starting point. Dive sites or dive destinations can also change in relatively short periods of time so a site or location that was deemed to be “World class” previously may currently not be assessed as this due to an array of reasons ranging from coral bleaching events, crown of thorns damage, or the impact of natural disasters such as tsunamis or cyclones, to over diving and associated damage and over fishing. Similarly, in my experience, properly protected areas such as marine parks and reserves tend to improve with time and may become “World class” where they may not have been previously. My recommendation is do your homework here. Responses will vary significantly depending on whom you ask and the personal experiences they have had. Ask as many people as you can for advice. If a destination keeps coming up time and time again from a number of different sources, chances are it is a worthy destination. You’ll also have your own personal preferences on the type of diving you enjoy, such as wrecks, temperate or tropical waters, currents and level of difficulty as well as types of marine life. For me, I like a location that will challenge me, I love currents that bring in nutrient rich waters and a diversity of marine life and I love big stuff. As a result, I’d be unlikely to select an area that was purely a macro heaven or had perfectly nice reefs and easy diving. Should I use a Booking Agent or book direct? There is no right or wrong answer here. Suffice to say shop around. A booking agent will be able to assist you in making your choice, however, bear in mind that the advice may not be truly independent! Agent websites are a good place to compare and contrast operators, boats and prices and in some cases availability. You are certainly entitled to ask the agent what commission they receive for making a booking with an operator. In some cases, agents will bulk book spots and be able to secure special deals because of the volume of spots they sell on behalf of the operator. These spaces may in some cases be cheaper than going direct to the operator. In other cases, you may be able to negotiate a better deal with the operator direct as they will be saving paying any agent commissions. Some operators book out years in advance and discounts are unlikely, however others may offer low season rates or last minute standby rates if you are flexible. Booking agents may also be able to arrange your whole package, including flights, stopovers, transfers and accommodation which can take the pain (and potentially the fun!) out of planning your trip. As part of your research, you should determine when is the best time of year to dive in your chosen destination. Operators will generally have high and low season prices which may be determined by school holiday season and/or seasonal weather. In tropical locations there will be a wet season and a dry season. Wet season may typically be associated with higher temperatures and often an associated higher amount of algae in the water (potentially affecting visibility), wind and the occasional cyclone. Of course, there will always be luck involved, but I would be more cautious about booking a liveabaord out of the high season times without doing your research. After having worked on a liveaboard for several years, I can confess that the weather is rarely like it shows in the brochures! There are certainly times of the year when you are most likely to have favourable visibility, temperature and weather. Dive, eat, dive, eat, dive, eat, sleep! When reviewing the pricing of a trip, it is important to review in detail exactly what you are getting for your hard earned cash. Read the small print. Specifically look at what is included and what is extra. “Hidden” extras may vary from gear hire, torch hire, use of a dive guide, night dives, and additional dives to fuel levies, marine park fees, Nitrox, drinks, transfers and flights. Also bear in mind the all-important weight allowance on flights and excess baggage fees for heavy dive gear and camera equipment. The number of divers on the liveaboard is something else to take into account. More divers equals more divers in the water. 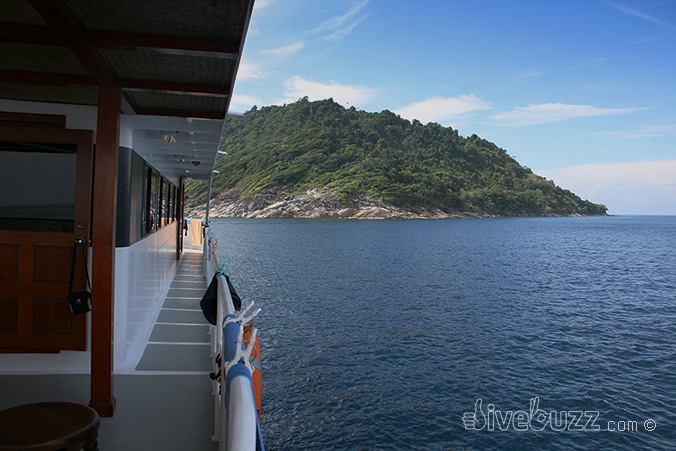 Some liveaboards offer an open dive deck, allowing the diver to choose when and how often they want to dive, thereby avoiding all divers being in the water at the same time. A more exclusive experience, with less divers, will obviously have an associated higher cost. The diver to crew ratio also has an impact on overall cost, but also on overall experience. As a dive addict that likes to dive as much as possible on a trip, I like to choose operators that offer as many diving opportunities in a day as possible. I’ve seen operators that offer only 2 to 3 dives a day and I find myself wondering what I’ll be doing at sea with the rest of my time! Although five dives a day is possible with some operators, four dives may be the optimum number for most people. One trick that I always use when planning a liveaboard (or indeed any diving centred holiday) and comparing prices is to calculate the total cost of the trip and divide it by the number of planned dives to calculate a per dive cost. This I find is the most powerful way of comparing value for money. Using this method, some dive holidays will result in quite an astronomical cost per dive whilst other dive trips, often the high end dive intensive liveaboards, will show good value for money on a per dive basis. Think about how good you expect the dives to be and ask yourself whether you think the cost per dive will be worth it? Most liveaboards will have crew tip boxes at the end of the trip, so don’t forget to factor in your tips for the hard working crew as part of your calculations. Working on a liveaboard, whilst a lifestyle choice, is certainly hard work and many crew members rely on tips to supplement their wages. So don’t forget, consider where, when and how much and you’ll be well on your way to planning your dream liveaboard trip, specifically tailored to you. So what are you waiting for? Get planning your perfect liveaboard holiday now. 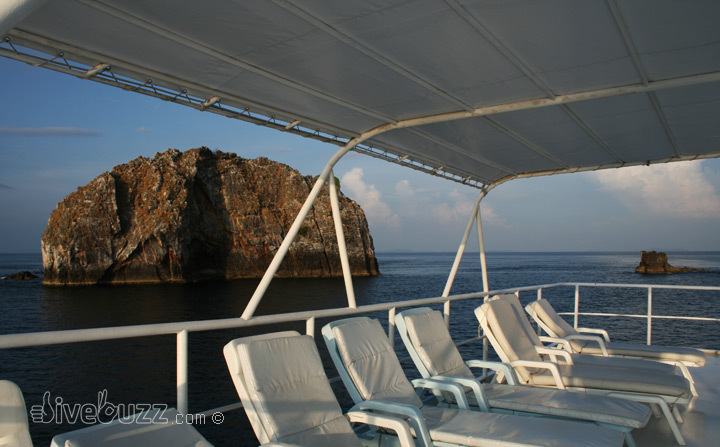 Have you experienced the liveaboard life yet? Where was your favourite liveaboard experience so far? Where are you going on your next liveaboard? Good article – I read it after finding your comment on our Facebook wall. As someone who works in the dive travel business I can verify that there’s some sound advice in your article. I suggest you post the link on Scubaboard and Scubalife as well – good quality content attracts readers. I’ll pass my recommendation on. Thanks for your comment. We intend to bring lots of sound advice and great content – that is the mantra at divebuzz.com! Will share with Scubaboard, but we are not aware of Scubalife? I also enjoyed reading your excellent article. With regard to using a booking agent or booking direct your advice is sound – there is no right or wrong approach – different horses for different courses. Having lived in the Maldives for 6 years, I know many of the Liveaboard owners operators struggle to market their boat trips by themselves. With this in mind I established http://www.liveaboards.com last year. The purpose of the site is to provide a place where Liveaboard Operators can list their trips and provide information about their boat with the objective of connecting holiday-makers directly to the boat operators. Booking Enquires can be accepted using a plug-in for Facebook and the Boat Operator’s own website. To ensure the site truly independent we provide the liveaboard operators with tools to survey past travellers in an automated fashion and display the trip review results with their listing. I would encourage Liveaboard Operators and Liveaboard dive enthusiasts to check-out the site. Once again J9, thanks for a very informative article. I am glad you liked the article. There is a lot of very average advice out in the public domain about diving and everything diving related and my aim is to provide quality, objective content that divers can go to and trust. It’s good to hear that I am achieving this with your feedback. Liveaboards.com sounds great… let me have a look now!